On the roof of a building in New York, Dragon and the Turtles have finished demolishing a living gargoyle. Mission accomplished, Dragon bids his new buddies farewell and heads back to Chicago. 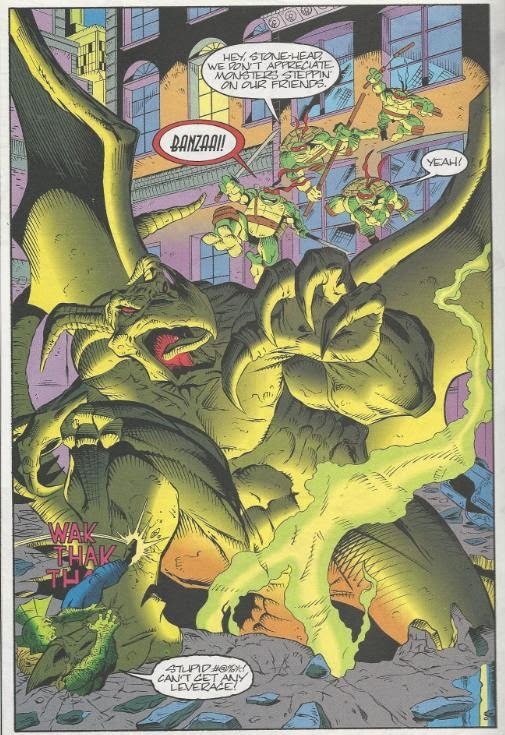 The Turtles ask him to stay, hoping to get to the bottom of who brought the Gargoyle to life, but Dragon just wants to get back home. Taking a six story plunge and landing on his feet, Dragon boards a taxi for Laguardia. Not far away, the mysterious woman with ridiculous hair is observing Dragon’s departure, cursing New York’s sudden superhero infestation. With an unearthly glow, she announces that even though her magical powers are not fully restored, she will do what she can to ensure the heroes do not interfere with her plans. She uses her powers to cause an “earthquake”, which turns out to be a giant stone monster bursting up from beneath the streets. Dragon exits the cab and rescues an old man in the monster’s path, only to get stomped on by the behemoth. Luckily for him, the Turtles leap down and pile on top of the creature, giving Dragon enough time to gather his strength. Dragon then hurls the beast into a bunch of power lines, electrocuting it. A cop arrives on the scene and Dragon tells him to put an ABP out on anymore gargoyles, as there’s likely to be more. He turns to thank the Turtles, but finds they’ve disappeared. Dragon heads over to the 13th Precinct and introduces himself to the surly Captain Lowry, who reports more geriatric deaths at the hands of stone gargoyles. Elsewhere, the Turtles enter the hole the beast emerged from and follow a glowing light down the sewer tunnel, unaware that it’s emanating from the mysterious woman behind the monsters. The tunnel eventually leads them to the entrance of the New York Public Library where they come face to face with their foe: Virago. She brings the lions in front of the library to life and swears revenge on the Turtles for destroying her gargoyles. Back at the 13th Precinct, Captain Lowry gets a call about the Turtles fighting the lion at the library. Dragon asks to take care of the issue and Lowry gives him one hour to resolve it. At the library, the Turtles are doing just fine on their own. Raph successfully destroys the cherished piece of New York architecture by smashing it with a parking meter. Virago realizes her powers are dwindling too rapidly and, bringing the other lion to life, leaps onto its back and rides away. The Turtles give chase, but Virago’s escape is impeded by the arrival of Dragon, who smashes the lion with a single punch. They thank Dragon for the assist but discover Virago still isn’t down for the count as she brings the statue of Atlas to life. Atlas hurls its globe at Dragon, flattening him. Dragon recovers and tries to share some witty dialogue with the Turtles, but can’t tell any of them apart (so he recommends they wear their initials on their belts or something). Dragon then smashes Atlas’s head. With her powers now completely drained, Virago attempts to escape on foot. The Turtles and Dragon corner her and she threatens to unleash the full brunt of her mystical abilities. Dragon isn’t buying it and calls her bluff. A short time later, Virago is arrested and hauled off into custody, swearing vengeance. Dragon still doesn’t know why she was targeting the elderly, but just decides to forget about it, file his report and go home. One of the police officers compliments him on a job well done, but Dragon refuses to take all the credit, explaining he had some help from “the locals”. On a rooftop, the Turtles look down approvingly and share a glance with their new bud. *This story is continued from The Savage Dragon #2. *The Turtles will meet Dragon again in TMNT/The Savage Dragon #1. *CHET ALERT: The store the old man Dragon rescues takes refuge in front of is named “Chet”. The use of “Chet” is a running gag throughout Mirage’s TMNT comics since they…just like the name. 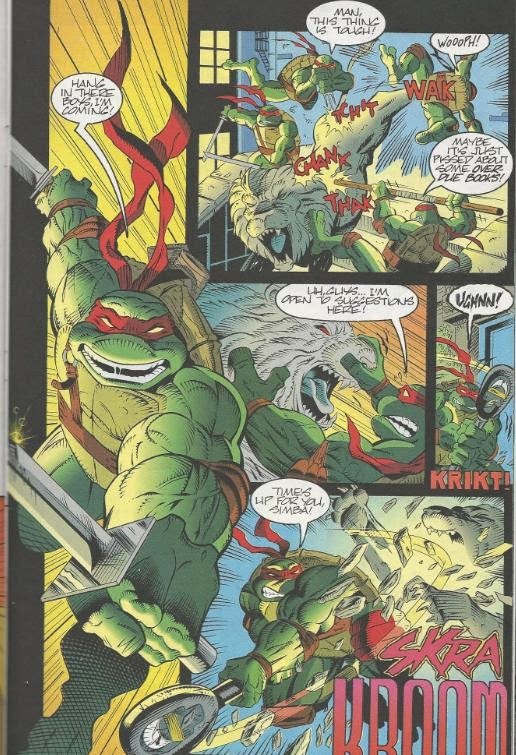 *The events of this crossover arc will be referenced in TMNT (Vol. 2) #3, thus making it canon in the Mirage continuity, at least on some level. 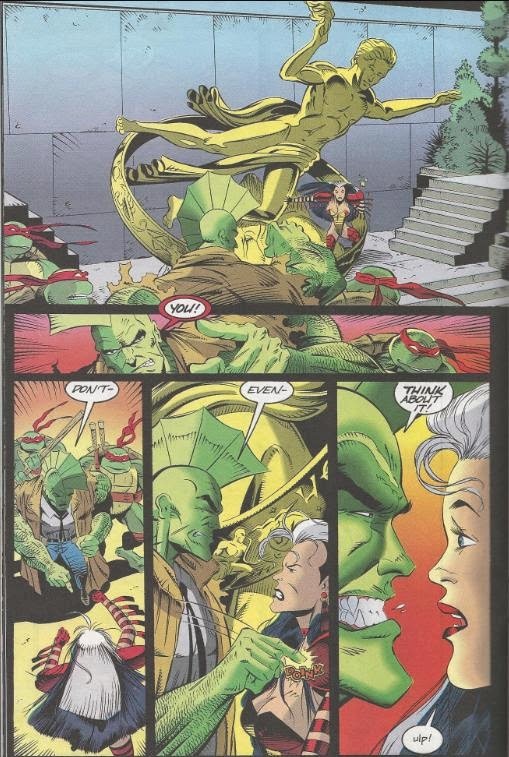 So, the two-part Savage Dragon/TMNT crossover comes to a conclusion this issue, but was it a success? Well, yes and no, I guess. “Yes” in that, as a crossover, it successfully took the characters from two different franchises and put them on the page together and had them interact. But “no” in that it was a pretty lousy, meaningless story. Virago is an utterly shallow, dull husk of a villain. The motivation behind her machinations goes unaddressed in this story and if it’s ever explained in any future Savage Dragon comics, I don’t know about it and I could hardly care. 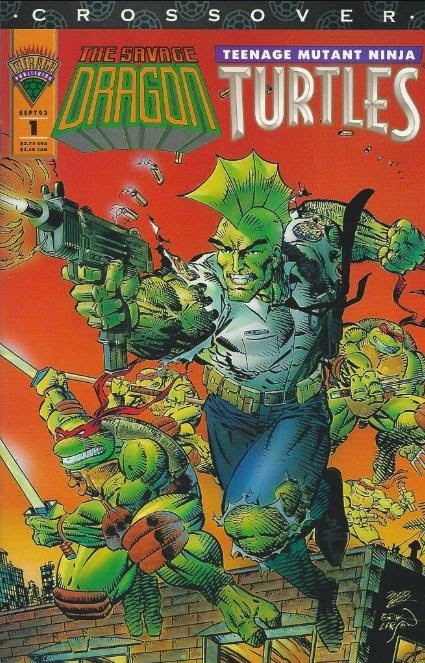 The story was almost offensively straight-forward: a generic bad guy brings a bunch of statues to life in New York, Dragon teams up with the Turtles to defeat them, the bad guy goes to jail, The End. There’s simply nothing of substance to offer, here. The opening letter by Michael Dooney sort of explains why this crossover was so hollow. Dooney was apparently good friends with Larsen and the pair had wanted to work together on a project for years. With the creation of Image Comics and The Savage Dragon, that opportunity finally presented itself and they seized it. Unfortunately, they didn’t really have much of a product in mind, they just wanted to draw each other’s characters. So that brings me around to what I guess is one of the crossover’s finer points: the art. I already commented on Larsen’s art from the first half of the arc, but this one was done by one of the all-time Turtle Greats: Michael Dooney. Dooney is awesome and that’s all there is to it. He draws one of the most iconic and crowd-pleasing versions of the Turtles you’re likely to find and he’s just a master of his craft. His artwork on this issue is mighty fine, though the Turtles seem a tad more…”roid-raging” than he usually pencils them. Meanwhile, the Dragon isn’t chiseled from the same grotesque Liefeldian proportions that he usually is. Odd, right? Dooney seems to be making an attempt to mimic some of Larsen’s visual gimmicks, though he doesn’t always pull them off. Larsen’s “speed lines” that I mentioned in my review for the first half of the arc? Yeah, well, Dooney kind of goes overboard with them. Well, there’s at least one upside this crossover: it set a precedent that eventually lead to some genuinely good stories. 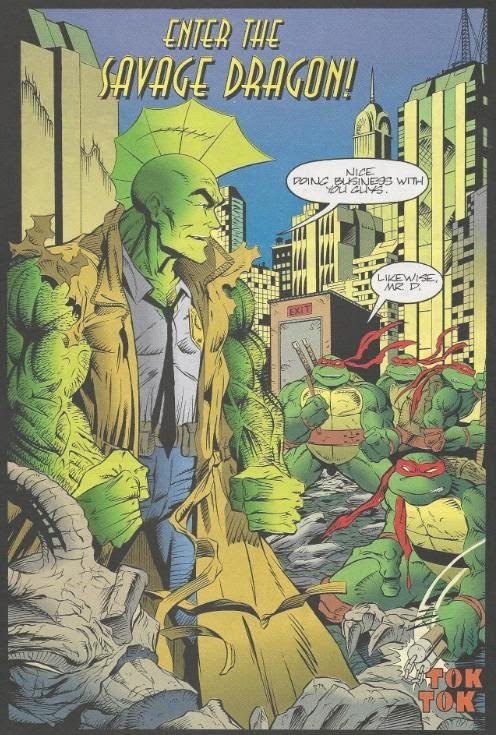 The next two-part TMNT/Savage Dragon crossover is leaps and bounds better than this one and nearly the entirety of Image’s TMNT (Vol. 3) series is a great read. Unfortunately, this first team-up doesn’t amount to much. You know, for the life of me I never figured out if these Dragon crossovers should still be considered Peter Larid-approved Mirage canon. There is that sublte Volume 2 reference, and the second TMNT/Savage Dragon Special published by Mirage certainly seems to advance critical Mirage continuity regarding Radical's depowering that seems to hold up for the rest of the series. I linked your review of this issue on my review of The Savage Dragon 2 on my comics blog Focused Totality. For those curious to know how the story continues, as I don't have that one shot. Virgo finally came back in Savage Dragon #210. It turns out that she feeds off the lifeforce of her victims to grant her eternal youth, and to help animate her stone monsters.